As both a coach and an athlete, I have been able to achieve amazing results by focusing on nutrition. Nutrition that upregulates thyroid gland functioning, balances hormones, reduces cortisol and optimises health. Fat loss favours a fast metabolism. HORMONES AND METABOLISM MATTER EVEN MORE THAN CALORIES. Through my experience and research, I have learnt that fat loss and muscle gain is more correlated with hormonal balance and metabolic rate rather than how many calories are consumed. I used to diet on a devastatingly low 1200-calorie low carbohydrate plan and really struggled to drop fat. Now I can get lean without cardio due to Pro-Metabolic Nutrition. My metabolism is faster and I eat between 2500-3000 calories of delicious food a day. WHAT ARE THE IMPORTANT ELEMENTS OF A PRO-METABOLIC NUTRITION PLAN? 1. INCLUDE NUTRIENT RICH SOURCES OF SIMPLE SUGARS. Natural sugars found in ripe tropical fruit, raw honey, pure orange juice, dairy products and root vegetables help increase T4 to T3 conversion and upregulate metabolism. 2. ELIMINATE PUFA’S (Polyunsaturated Fatty Acids). PUFAs include nuts, seeds and vegetable oils. Whilst these foods are considered healthy, they also suppress thyroid gland functioning. 3. INCLUDE PRO-THYROID SATURATED FATS. Such as real cream, coconut oil and organic butter. 4. EAT BALANCED MEALS of carbs, fats and protein to ENSURE STABLE BLOOD SUGAR LEVELS. When protein or carbohydrates are eaten on their own, insulin can either spike or dive. This results in the release of stress hormones from the adrenal glands. This process is anti-metabolic. 5. EAT ENOUGH FOOD. It is imperative to eat enough nutrient dense food to upregulate metabolic rate. Low calorie dieting slows metabolism. The boost and shred and hormonal balancing meal plans will drop centimeters off waists by eating MORE of the right food…not less food. 6. REDUCE DIFFICULT TO DIGEST FIBROUS VEGETABLES. Above ground cruciferous vegetables such as broccoli, cabbage, spinach and kale. Cruciferous vegetables are goitrogenic so will slow down thyroid gland functioning. Humans are also not ruminants and simply do not create the enzymes to break down the cellulose in these vegetables. This results in bloating and impaired thyroid gland functioning. 7. SALT all meals. White sea salt improves metabolic rate, supports thyroid gland functioning, suppresses stress hormones and reduces inflammation. 8. ENSURE CALCIUM TO PHOSPHOROUS RATIO IS HIGH. I include several meals of quality dairy like milk, yoghurt and cheeses, and add bone broth or hydrolysed gelatin. Calcium reduces the activity of the parathyroid stress response. A high level of parathyroid stress hormone suppresses thyroid gland activity. 9. ENSURE ADEQUATE MAGNESIUM. Magnesium deficiency can slow metabolism. Magnesium is also necessary to absorb calcium. 10. SUPPLMEMENT WITH GELATIN WHEN EATING PURE MUSCLE MEAT. Chicken breast or steak is high in the inflammatory amino acids tryptophan and cysteine. Tryptophan and cysteine can suppress thyroid gland functioning and can cause a hormonal stress response. Either eat quality whole animal proteins such seafood, dairy and eggs or include hydrolysed gelatin when muscle meat is consumed. 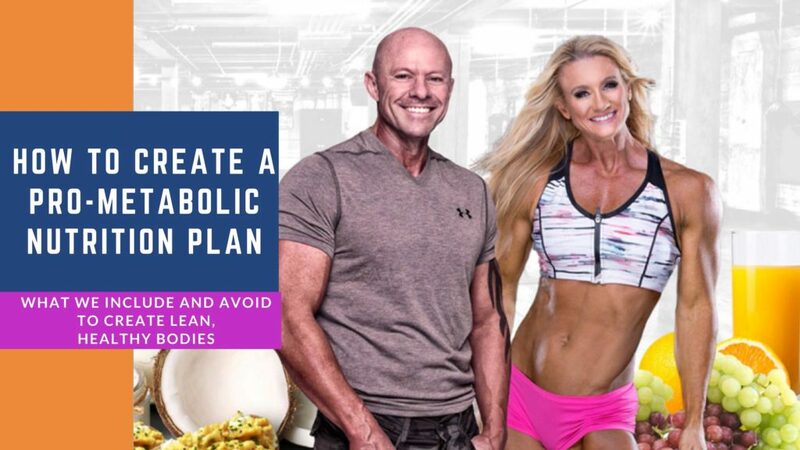 All Pro-Metabolic Meal plans are created around the above principles. They are healthy, balanced, and delicious and will result in improved thyroid gland functioning, faster metabolic rate and greater health. These are the plans I use to increase metabolism and get lean whilst remaining healthier and hormonally balanced. For more detailed information about how Pro-Metabolic Nutrition works. I also offer one-on-one individual consultations where I can prepare a customized plan. ← HORMONAL BALANCE. MY STORY TO THE MOST VITAL, YET OVERLOOKED, ASPECT TO FAT LOSS.